The other day, London Greens heard from twenty candidates putting themselves forward to be selected to stand for the Assembly in 2020. The Green Party is selecting an ordered list of candidates to represent the party in the proportional part of the Assembly election in 2020. The list order matters. The two people at the very top of the list are likely to be elected and if we run an incredible campaign we might get a third seat. My speeches below were made in the hope that London Greens will re-select me (and Sian) at the top of the Green Party list so I can continue my work in City Hall and contribute my work and experience as an Assembly Member to London Green Party’s election campaign. Please don’t assume that Sian and I will be safely at the top of the Green Party list. If you want us heading up the campaign then you need to vote for us at the top of your list of candidates. For the last two and a half years I’ve been working in a team with Sian Berry as a Green London Assembly Member. and pushing the Mayor of London to make his policies smarter and greener. In this past week, I’ve joined precarious workers in the gig economy on the picket line outside TfL, protesting against the congestion charge. Now, I believe the congestion charge should apply to private hire, but should be paid by the operators and not by some of the most exploited workers in our city. Building on my background as a transport campaigner, I’ve focussed on traffic reduction, cleaning up our air and improving conditions for walking and cycling. I’ve concentrated on outer London as that is where we need so much more investment in our streets, so people have safe and healthy alternatives to driving and so they can trust the air they breathe. No Londoner should be left out of the Ultra Low Emission Zone. I’m currently Chair of the Environment Committee, and last week it looked like I’d have to submit a minority report, as Chair, opposing aviation expansion in London. After a week of hard negotiation, against all the odds, Ukip, Tories and Labour are now on board with opposing all aviation expansion in London. That is a win that I’m proud of. I hope you can tell just how much this work matters to me. If it matters to you, then I hope you will re-select me and place me at the top of your list when you cast your vote. Climate Change is the biggest issue facing us and tackling it needs to be a mission at the heart of all public policy objectives. One of my proudest moments as an Assembly Member is getting the Mayor to declare a Climate Emergency and to update his plans first to make them 1.5 degrees compatible and just this week, at Mayor’s Question Time, getting him to commit to do the analysis to bring forward his timetable from 2050 to 2030, as Gulnar just called for. I was glad to speak this week in support of the Mayor’s call for withdrawal of Article 50 and a People’s Vote. I’m on the EU Exit Committee at City Hall and only too aware of the plight of EU citizens, our neighbours and colleagues who are facing Theresa May’s hostile environment and the threat that the shocking treatment of the Windrush generation may be extended to them. It’s not all global or national catastrophe, on a really practical level my grass roots work as an Islington councillor has informed my work on the Assembly. Residents across my ward, like the woman Benali mentioned, trusted me to show me they suffer from cold, damp, mouldy homes, with condensation worsened by overcrowding, new plastic windows and fuel poverty. Based on that councillor experience and a visit to Thamesmead, I’m shortly publishing a London Assembly report looking at solutions that are affordable and could be rolled out widely. 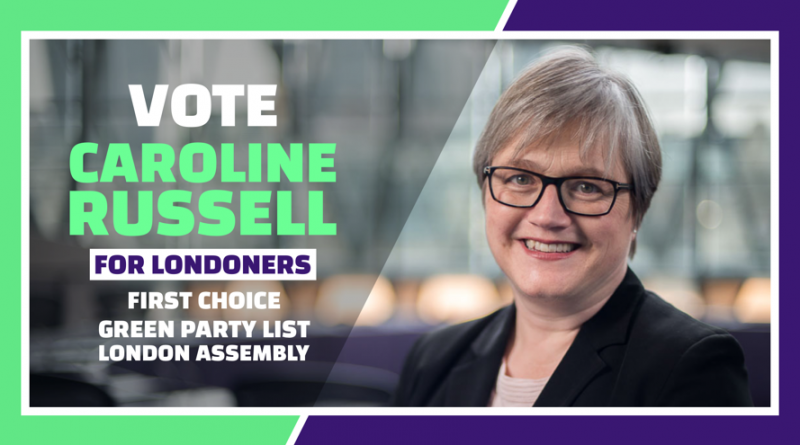 I’m so looking forward to working with a campaign team that represents all Londoners and today I am asking you to put me top of the candidate list. The most important thing, for Londoners and London Green Party, is that we select a strong team and run the best campaign London Greens have ever run. A vital part of that is supporting local parties across London to develop the campaign infrastructure and skills to ensure we elect more councillors across our city in 2022. Sian and I have proved by the way we work, the impact that a small group of Greens can have on the London Assembly and that’s why I hope you’ll reselect me at the head of our list of candidates representing the Green Party in this election.